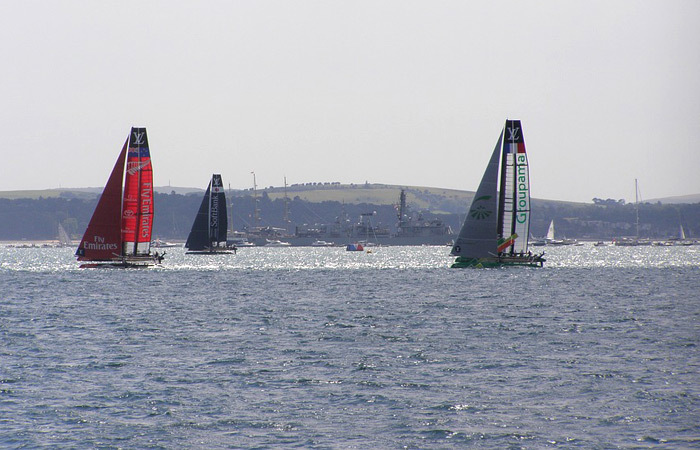 The America's Cup is one of the oldest international sporting trophies in history. John Cox Stevens, a member of the NYYC, formed a six-person syndicate to build a yacht to take to England and race it to make some money. In 1851, the Royal Yacht Squadron from England and the New York Yacht Club raced around the Isle of Wight in England. The NY yacht club won, quickly renaming the sport “America’s Cup”. The sport is a competition between two sailing yachts. One yacht is the defender who represents the yacht club (holder of the America’s Cup) and the second yacht is the challenger, representing the yacht club that is challenging for the cup. The timing of each competition is determined by an agreement between the defender and challenger. The requirement to join the sport is specified in the Deed of Gift to the yacht club who wants to challenge and try to win the cup. If the challenger win, they gain the stewardship of the cup. The New York Yacht Club held the trophy from 1957 until 1983. The original trophy was donated to the NYYC. In 1983, the Royal Perth Yacht Club won the cup from the NYYC, breaking the longest winning streak in history of sport. The RPYC was represented by the yacht Australia II. From 1870 until 1967, only one team had challenged for the cup. In 1970 there were quite a few challengers, so the NYYC accepted them all and ran a competition, with the winner competing against the NYYC. The GGYC will try to defend the cup on the 35th America’s Cup which will be held in 2017 in Bermuda. The top Challenger advances to the America's Cup Match against Oracle Team USA. The Challenger Qualifiers will be between May 26 and June 12 with the America's Cup Match to be between June 17 and 27.